When I got up Floris was in full swing in making koko rice her way this morning, as she didn't like how the mama of the village had made it!!! Its quite a task to dehusk the coconuts and then to scrape out all the flesh and then hand squeeze the cream out. It was very good - chocolate rice pudding Samoan style! After breakfast I was drawn to go and speak to Ifo, the elder we had interviewed again and spend some more time on his Farm. His daughter came to walk me over to their farm. As she is a Matai (Chief), it is important that she follows protocol. As we walked we talked about our lives and journeys. She has just returned from NZ after being there for 10 years to look after her father and to learn the ways of Cacao with her husband. We talked about the interview and I described what I experienced when I hear Ifo's name. She loved hearing what is She. Although she is a Matai she describes herself as spiritual rather then any one religion and that all religions lead to the one God. I later discovered that her father is Bahai and we had visited the Bahai temple in Samoa the previous day. A very beautiful space that is embracing of all religions. I sat with Ifo in the shade and his daughter translated. He had some beans sun drying and I tasted them - they were sweet and full of flavour with hardly any acidity. He said he only drys them for four days as after that the skin begins to crack and they become vulnerable to bugs. I guessed that they were sitting at around 50degrees in the sun and on the lava rocks (which is how he dries them). He said it was very hard to get the next generation to really listen to the Koko trees and that he is concerned that they will use chemicals on the land. What will happen to his grandchildren and their life on the earth if the land is not honoured and taken care of. I expressed to him that he needed to take Floris and Poa his daughter on as apprentices and set up training programs for the village, and that his standards become the village standards. He laughed and agreed. I hope he does! He said that his education was under the trees! We headed to the big market before going to the ministry. Now this was a treat!!! Rows and rows of tropical fruit for sale, and in this I discovered even more fruit that grew on Floris' land amongst the trees, avocados, mangoes, star fruit.. We saw avocados the size of melons - unfortunately they weren't ripe but back in NZ they would have lasted my family three days of goodness!! The real treat was walking to stall after stall of cacao beans for sale. Smelling them and asking what region they were from. Such variances in fragrance depending on the farm and region. The major difference was Koko that came from Savaii, the smaller of the two Samona islands. The fragrance and flavour was very different. 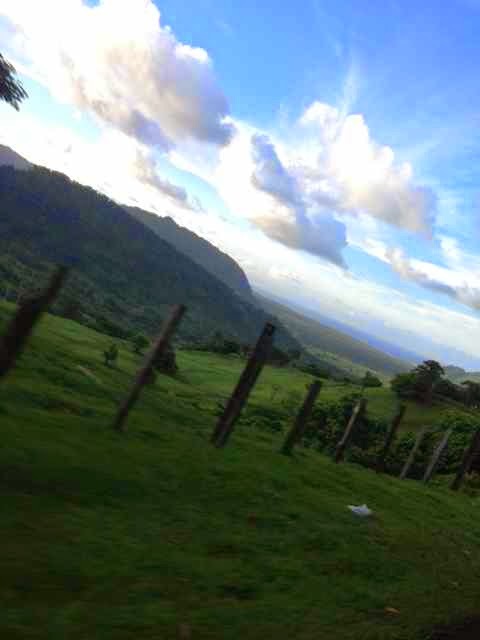 The Cacao from Savaii grows on black lava fields. We will be visiting this island tomorrow for a few days. And then each stall was also selling Koko Samoa, which is the bean roasted and hand ground, so it is quite grainy. This is what is used in the drink that Samoans drink every night. Every single stall's Koko Samoa was burnt. I would pick it up in anticipation of meeting the fragrance that was experienced in the beans and the dominate fragrance was always burnt cacao. Here were stunning full flavoured beans and next to them, their usage, black blocks of not just over roasted but well and truly burnt cacao liquor. I have a mission to make Koko Samoa with unburnt beans. I wonder if the Samoans will like it? Perhaps their palate has become so in tune with the burnt taste that that is how they like it? We will have to do a taste test on the locals to find out!!!! When we got to the Agricultural building, the minister for cacao was not there but out in a village. Floris rang him and he said to come and pick him up and he would come with her to her farm. After spending three hours with this gentleman - we called him Mr Koko. He liked that. His knowledge was incredible regarding Cacao. He had worked with it for the last 30 years on developing Koko Samoa Pure. 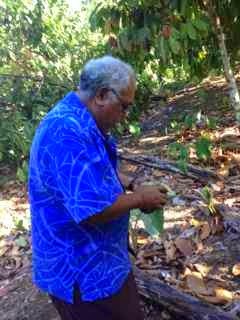 He was unwaveringly sure that Samoa grows the best Koko in the world. I asked him where was the second best place that grew Cacao and he said Ecquador. He knew the history of Samoan Cacao. The Germans brought it when they came to Samoa at the end of the 18th century and it was most wide spread before the first world war. The strain was Trinitario which I explained in one of the previous blogs. When they first planted it, they planted it with Criollo so it could keep cross breeding. However in the 70's a variety of Forestaro was brought to further the growth of Cacao as it was a robust variety and a dominate species and has been taking over ever since on farms that are not focused on Koko Samoa Pure. The Trinitario is full flavour with low acidity and the Criollo variety even finer. I asked Mr Koko Man how you could tell the variety in terms of what each pod looked like. He said the only way to tell now a days was to crack open the pod and look at the colour of the beans inside. The Criollo is a white bean, Trinitario is half white and half purple - literally one half of the pod has white beans and the other half light purple. 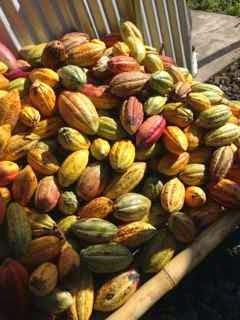 So we went into the plantation and Fatsa, The Koko Man, would select a pod, and ask us to guess its variety. Very soon we were able to identify most trees. However the amazing thing is that a tree can grow two varieties and can even have a pod looking like one type but actually be a cross. Floris' farm is mainly Trinitario with some Criollo and some Forrestaro which she would like to remove. Ifo's farm is pure Trinitario as he only ever increased his crop by grafting from his own trees. Fatsa shared all the amazing work the Ministry of Agriculture have being doing to invest in Samoan Koko and bring back what they call Koko Samoa Pure - which is pure Trinitario. 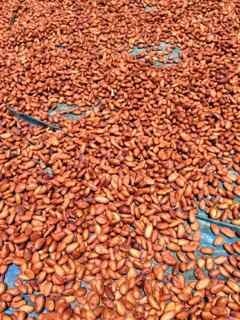 He called the variety of Forestaro that was brought in in the 70's Soloman Koko as that is where that strand of Cacao came from. The acidity in the beans were incredibly different. You could eat the preripe beans of a Criollo tree, unlike the other two varieties. We opened some young pods and it was like eating a tropical apple, crunchy tart and tropical!!! I asked Fatsa an honest question - given that Koko Samao is so amazing and he has spent so much time in developing its amazingness - what does he feel about it then being burnt in Koko Samao as its main use? He turned to me and said - that is why I am excited your company is here - to take Koko Samoa to the world! !